Lesotho is a small mountainous country, enclave of South Africa, by which is entirely surrounded. Here the climate varies essentially with altitude: it is temperate at the lowest elevations, which don't go, however, below 1,400 meters (4,600 feet), while it gets colder as you go up in altitude. In Lesotho, the weather is often unstable, with rapid changes in wind and temperature from day to day. Winter is the driest season, while summer is the rainiest. Being in the Southern Hemisphere, it obviously has reversed seasons in comparison with Europe and North America. The capital, Maseru, is located at 1,600 meters (5,250 feet) above sea level, but most of the country is crossed by the Drakensberg range, and lies above 2,000 meters (6,500 feet); the highest peak is Thabana Ntlenyana, with its 3,482 meters (11,424 feet). In Maseru, the climate is temperate: it's warm in summer, sometimes hot during the day, but with cool nights, while it's mild in winter during the day but with cold nights. In fact, the temperature range between night and day is generally wide. In summer, from November to March, highs hover around 24/28 °C (75/82 °F) and lows around 12/15 °C (54/59 °F); this is also the rainy season because of afternoon thunderstorms, which, however, don't reduce too much the sunshine duration. In winter, from May to August, lows are slightly above freezing (0 °C or 32 °F), while highs are around 16/19 °C (61/66 °F). Here are the average temperatures of Maseru. Precipitation in Maseru mounts to 660 millimeters (26 inches) per year, including more than 85 mm (3.3 in) from November to March, while in winter precipitation is scarce. Although winter is a dry season, sometimes snow can fall. Here is the average precipitation. The sun at Maseru shines all year round, as can be seen in the following table. Snow is more common at high altitudes, above 2,000 meters (6,500 feet), where even rainfall is more abundant. 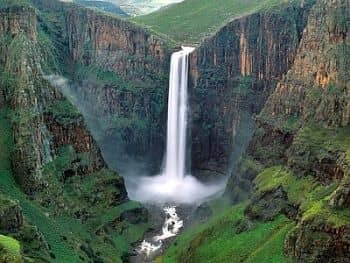 Despite the fact that it is the rainiest season, the austral summer, from November to March, is the best season to visit Lesotho because in any case it's sunny, and at night it's not as cold as the rest of the year. During the day it can get hot at lower altitudes, but nights remain cool: even in Maseru it will be useful to bring a sweater for the evening. In this period, however, some mountain roads may be impassable because of the rains. You can also go in spring and autumn, especially in April, September and October, when the temperatures are mild, although there are still considerable differences between night and day; the sun frequently shines, rainfall is possible but not abundant. Sometimes, however, at night it can freeze even in spring and autumn, and it can snow at high altitudes. In winter (June to August): in Maseru, bring spring/autumn clothes, a sweater and a warm jacket for the evening; above 2,000 meters (6,500 feet), a down jacket, gloves, a scarf, a hat, hiking shoes. In summer (December-February): in Maseru, bring light clothes for the day, a sweatshirt and a jacket for the evening, a sun hat, a light raincoat or umbrella; for the highest elevations, a sweatshirt or sweater, a warm jacket, hiking boots.